Sometimes, you’re just really craving something. During the Steelers game on Sunday night, I found myself longing for a Cookie Fudge Fantasy from Eat n’ Park. For those of you not familiar, Eat n’ Park is a local diner chain in the Pittsburgh area. Anyone who grew up around here likely recalls fond memories of piling into booths after football games, basketball games, a group date to the movies, before/after prom… you don’t really need a reason to go to Eat n’ Park, you just go. It’s a ‘Burgh thing. And their Cookie Fudge Fantasy, mmm… it’s a tall sundae with layers of broken up chocolate chip cookies, vanilla ice cream and fudge, layer after layer, all topped with whipped cream and a big chocolate chip cookie. It got into my head on Sunday night and I couldn’t get it out. I hadn’t had one in years but suddenly I was craving one. 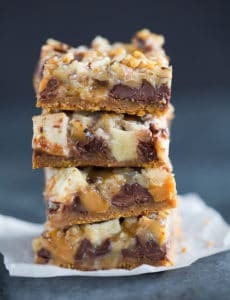 Then I remembered this recipe that I had spotted on Kevin and Amanda months ago, and figured it had to be just about the closest thing to a cookie fudge fantasy in baked good form. And so I made them. And then I died and went to heaven. 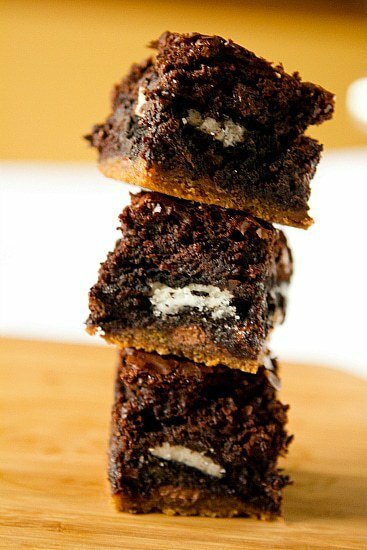 Gooey chocolate chip cookies, Oreo cookies, and fudgy brownies all piled on top of one another in one amazingly decadent, sinful treat. You can top with a scoop of ice cream if you want to go the truly sinful route, but it was a particularly dreary day in Pittsburgh and I was already feeling chilly, so I skipped the ice cream. But otherwise, Oh.My.God. Everyone needs a piece of this in their life. I cut the recipe in half and made it in an 8×8 pan (post-Thanksgiving portion control in full effect), but I think in the future I would just go for the whole recipe and either give some away or freeze them. I think Amanda’s have a more perfect ooey-gooey ratio going on, although mine were still insanely delicious! So that’s my one piece of advice – go for the whole enchilada and don’t try to halve the recipe, then give some away and make tons of people indebted to you forever. Added to this week’s to-do list: Get thee to Eat n’ Park. 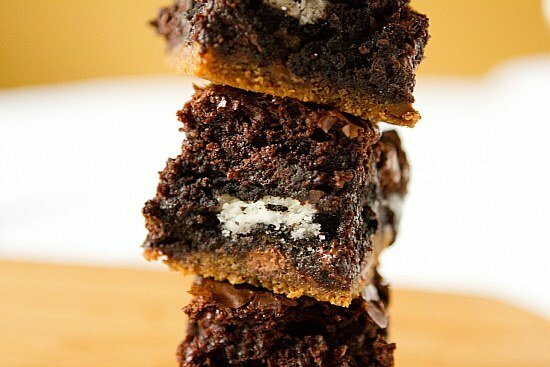 The ultimate sinful treat - a gooey chocolate chip cookie base topped with Oreo cookies and then fudgy brownies. Preheat oven to 350 degrees F. Butter a 9x13-inch pan, line with parchment paper, and then butter the parchment paper. In a small bowl, whisk together the flour, baking soda and salt; set aside. Cream together the butter and both sugars in a large bowl with an electric mixer on medium speed for 3 to 5 minutes. Add the eggs and vanilla and mix well to thoroughly combine. Reduce the mixer speed to low and slowly add the flour mixture into the mixer until the flour is just combined. Stir in chocolate chips. Spread the cookie dough in the bottom of the prepared 9×13 baking dish. Mix together the brownie mix according to the package directions, adding ¼ cup of hot fudge topping to the mix. 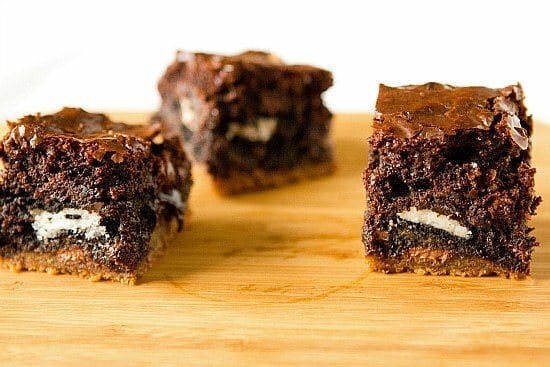 Pour the brownie batter over the cookie dough and Oreos. Bake for 45-55 minutes. Let cool completely before slicing into bars. Store leftovers in an airtight container at room temperature. 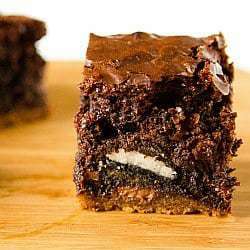 I am hoping to make these for a work function, but I want to bake them in muffin tins instead of a 9×13 pan. Do you have any suggestions for me to pull this off? Ingredient changes, prep changes, baking times? Thanks! I can’t wait to try these. Also, I have an AMAZING chocolate chip cookie recipe (you can’t beat grandma’s cookies). If I use my recipe, which normally bake for about 8 minutes, should I worry that the bottom layer will burn when baking for the longer brownie time? It’s possible that they could overcook, depending on the type of chocolate chip cookie recipe is it – obviously a thin and crispy recipe would be more prone to overbaking then a recipe for thick and chewy cookies. Hi Elisabeth, I have not tried to adapt this to a muffin or mini muffin recipe, so unfortunately I can’t give much guidance in terms of changing ingredients or baking time (which will obviously need to be less). I made these for my son’s birthday – his 3 favorite cookies in one dessert, and it was good. I chose the Ghiradelli brownie mix because my family and I do not like mix brownies (grew up eating my mom and aunt’s home-made, and sorry – the fake chocolate mix taste just does not cut it!). The Ghiradelli includes a package of chocolate sauce, so I skipped the hot fudge topping, but otherwise made them per the directions (minus parchment lining – didn’t need it). I thought that they were good, not sure if I’d make them again unless my son asks for them. I make something similar to this in the brownie pan from the Papered Chef. I use premade cookie dough, oreo cookies and boxed brownie mix. If you make the brownie mix for a 9 x 13 pan you will need to make 2 batches with the brownie pan which make 12 individual brownies so everyone gets the crunchy edges. if i use the homemade chewy brownie recipe, do i still add the hot fudge topping to it? can’t wait to try this recipe. looks so good! Yes, you can if you’d like, but don’t have to. This goes on the naughty list and I love my Naughty list. Is it alright to use the premade cookie dough…I have no time to make from scratch. Thanks so much. Can’t wait to make this. OMG OMG OMG…. off to a new yrs. eve party and I am in charge of dessert for kids. This is the PERFECT choice for the kids. (and I’m sure the adults will go after this as well). So happy I found this site…. everything looks amazing here. Can’t wait to try some other recipies. I made these for a potluck yesterday and they were a big hit. When I told the group what the dessert was several people’s eyes widened in absolute delight. I think half the pan was gone before we even started dinner. These were unbelievably yummy!! I made these to include in the cookie platters we like to give to neighbors for Christmas and they received rave reviews. Then I changed them up a bit when I made them for work and instead of Oreos, I used Reese’s peanut butter cups. EVEN BETTER! One of my coworkers stopped by to say, “I’ve always gone by the philosophy that if you are going to eat dessert, make it worth the calories- and these are definitely worth the calories!” Shoot, I wish that were my philosophy too, but unfortunately my philosophy for desserts is the more the merrier! OMG I am making these for Christmas dessert! I’m posting about this recipe and linking back to you (of course) in my meal plan monday post tomorrow! These were scrumptious. A big hit with the crowd. I had a much thicker cookie base from my 9×13 pan. 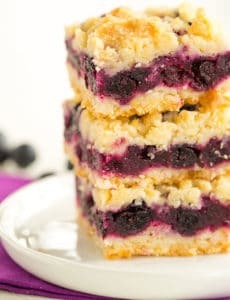 These were tall, thick, and chewy squares of yumminess. Definitely do not overbake; when they cool the gooey middle stiffens up. Tks for sharing! I made these last weekend, and oh so good! Especially over vanilla ice cream. I’m trying to get the hubby to take the rest to work so I don’t eat them all though! Definite diet killers! I’ve seen this floating around on pinterest and have been wanting to make it! I made these last fall … I got one (loved it), my husband got one (loved it), my cousin got 4 (loved them) and my dog got the rest (guessing he, too, loved them). Bad dog*, great recipe. I made these and took them to work today- EVERYONE loved them!! So rich, but soooo good! Just made this tonight for my family and a good friend. OH MY GOODNESS! I’ve made quite a few of your recipes and this is by far my favorite one. I had a baby last week and took a week long sabbatical from baking. I was so excited to make something and can’t believe how delicious it was. We served it with vanilla ice cream. WOW!!!! I saw this and almost immediately ran to the store for the ingredients! I made it last night and omg they were amazing. Waiting until the cool is definitely key, everything stays together so nice! Love it! Its 12.23 in the am and I’m up feeding the baby, wishing I has two things: one of these or an Eat N Park close by to go to after a totally sweet game of laser bowling. Ahhhh, to be back in PA. But seriously, these look to die for! 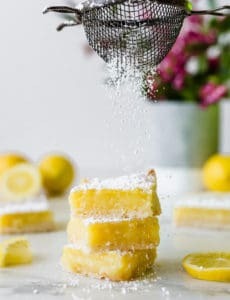 Can you post some tips about freezing your baked goods. I would love to learn how to freeze and then defrost the day of events. Hi Sarah, In general I will wrap individual servings of sweet goods (brownies, cookies, pieces of cheesecake, etc.) in plastic wrap, and then place in a larger ziploc freezer bag. I find that they stay good (fresh tasting) for 1-2 months. I usually just thaw at room temperature. Wow! These look absolutely amazing! I love Oreos. I love brownies. Then, add hot fudge? Sign me up! Definitely loving your blog right now! These look great too! This looks delicious! I have a question: what is fudge topping? Is that something you buy? Can I make it? Hi Leah, Yes you can buy it, where the ice cream toppings are located. You could also make it homemade, I think David Lebovitz has some recipes for it. This is just downright sinful. I’m salivating like a dog over here! Here I am everyday looking forward to see what a challenge you have done today and when I see the beautiful pictures and the great recipes that you’ve done, I’m like WOW!!!!!!!!!!!!!!!!!!!!!!! There is NO challenge for you!!!!!!!!! Keep the good work up!!!!! !